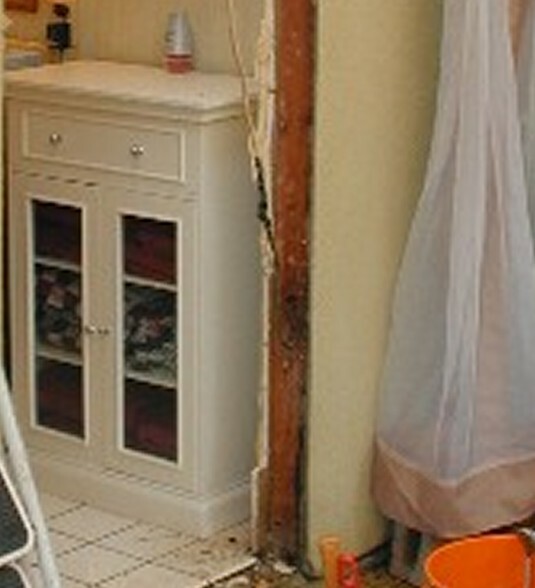 Register Log In ECN Forum Forums Violation Photo Forum New wall opening reveals spliced cable! These are the types of hazards that exist in the spaces behind closed walls. A door installer found this after making this opening for the new door. The discussion was centered around 300.4(D) but the real problem, as I see it was the buried splice to what appears to be a different type of cable. It appears that a new piece of romex was spliced to an old-style piece of romex. There is also a cavalier attitude toward future needs....they'll take the chance that there will never be a problem at that point, and justify it with "no inspector will ever see it." Also, the argument on the other site was not even related to the bad and illegal splice, but to 300.4(D) in a multi thread, reply after reply, that was becoming more and more involved by one Qualified Person, and another who chose to keep his profile blank (me-thinks he is a writer) and then the poor guy AL who cut the door opening, who was asking a simple question, which was answered very early in the thread, gets beat up by a poster. I finally ended the discussion! Oh, I forgot to mention that the poster sent a request to a real code expert, and the real expert sent one of his new "Lieutenants" to add a few words to try to settle the fuss .... I wish we were able to see each other when these discussion take place it would sure save a lot of time! I forgot to congratulate you formally here although I did on the chat train, now you will have to bite your tongue once in a while! I am sure we will enjoy seeing the comments behind your name. 300.4..."Protection against physical damage." I never would have focused on that part of the code. I just can't imagine there being a plan to leave this wire floating across the new doorway. While there are issues as to fastening or support of the cable, again. it is possible that it was originally "fished" through the wall- only to be exposed in this re-model. As far as bad manners, and "starting the brain before engaging the toungue go, well, I am only human, some things 'push my buttons' more than others, and I will confess a bias in favor of saying thing in a memorable way. Life would be awfully boring if everybody agreed all the time- it is tha mark of adult conversation that you can state your view, tolerate the views that differ from yours, and converse- without reverting to childhood sandbox squabbles. Joe there are many code experts and many times they disagree. The fact that you try to belittle those that disagree with you is disturbing. There you go again Bob! You are not aware of what I meant by those statements! No one disagreed with me, they were disagreeing with each other, and the fact that the NON-Electrician, and Qualified person were arguing about the kick plate was the issue. Don't always read into my posts looking to start up with your remarks! "The fact that you try to belittle those that disagree with you is disturbing."